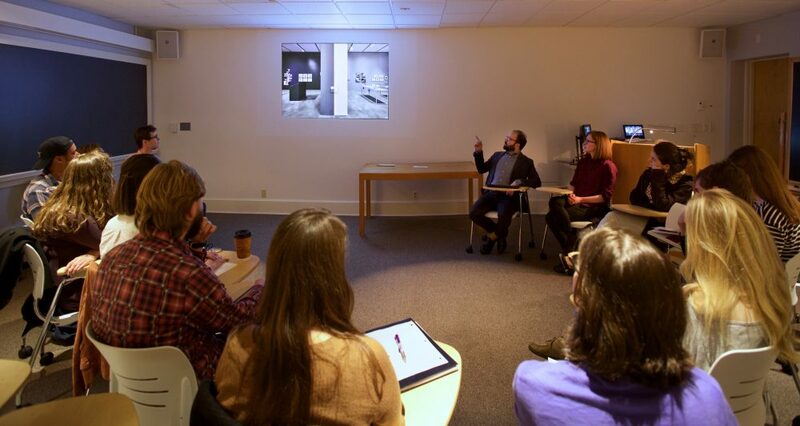 WCMA courses produce exhibitions, programs, and acquisitions. 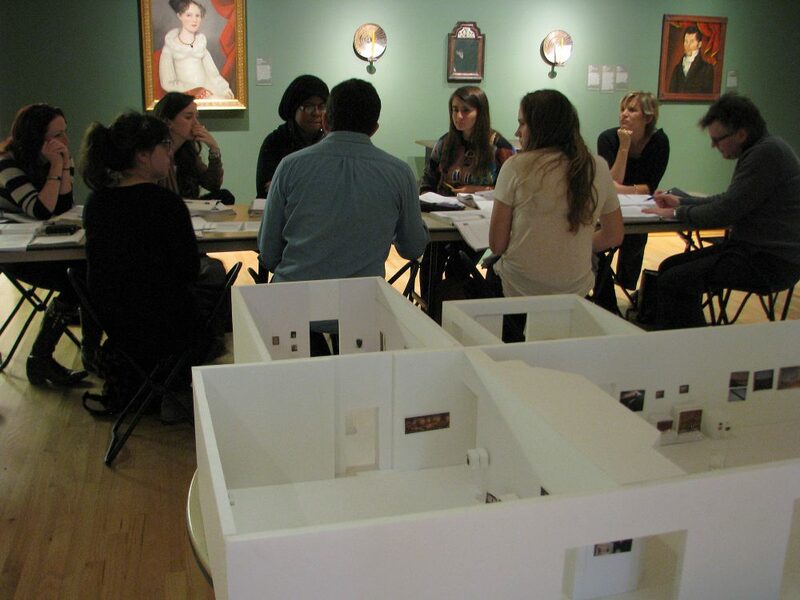 Students and faculty work directly with museum staff to activate the museum's spaces, collections, and publics. This winter study course will explore the role of museums in American culture has evolved dramatically over recent decades. No longer simply a repository of art and artifacts, the 21st century museum is a fully dynamic center of programming, cultural exchange, community building, and active inquiry. This is true across all types of museums–from art museums to scientific, historical, and specialty collections–and has affected every aspect of museum administration, from curatorial and collection priorities to methods of communication, fundraising, and engagement. With participation of WCMA staff, we will examine in-depth the role and behind-the-scenes work of contemporary museums. The class will include site visits to several area museums and discussions with specially skilled museum professionals, from directors, curators, and educators to collection managers, conservators, exhibition designers and development and communications managers. Students will research models of museum practice and brainstorm and develop proposals for the museum of the future. For the culminating project, the class will work as a group with WCMA staff to develop a gallery presentation and/or program that will connect with Claiming Williams Day. Class will meet for two 4-hour sessions at WCMA along with a third session per week to visit area museums. The mural in the Log, a venue for students, faculty, alumni, and the community. 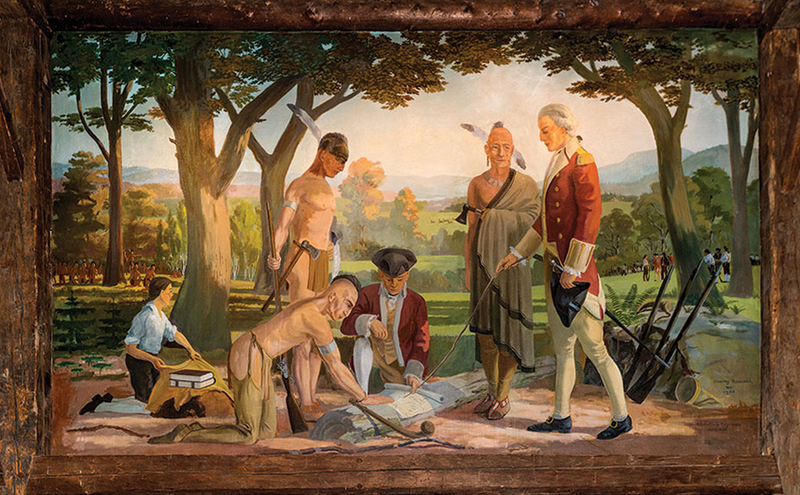 The mural depicts Mohawk leader Theyanoguin (also known as Chief or King Hendrick) and Col. Ephraim Williams. Sparked by current controversies around visual representations at Williams, this course–a joint effort of the Williams College Museum of Art and the American Studies Program–interrogates the history of the college and its relationship to land, people, architecture, and artifacts. Students in this course will examine the visual and material culture of Williams and the land it occupies to uncover how the long and complex history of the college reverberates in the spaces and places students, faculty, and staff traverse daily. We take seriously that objects and environments are not neutral nor are the atmospheres that they reflect and produce. Our interdisciplinary approach draws from the methods and theories of American studies, art history, material culture studies, critical race theory, gender studies, and eco-criticism. Topics of discussion may include: the foundation of the college and displacement of native populations; buildings, objects, and monuments linked to Williams’ evangelical history and the role of missionaries in American imperialism; the symbolic meaning of the varied architectural styles at the college; and the visibility/invisibility of the college’s relationship to slavery and Abolitionism. Cotaught by Senior Curator of American Art Kevin Murphy and Professor of American Studies Dorothy Wang. 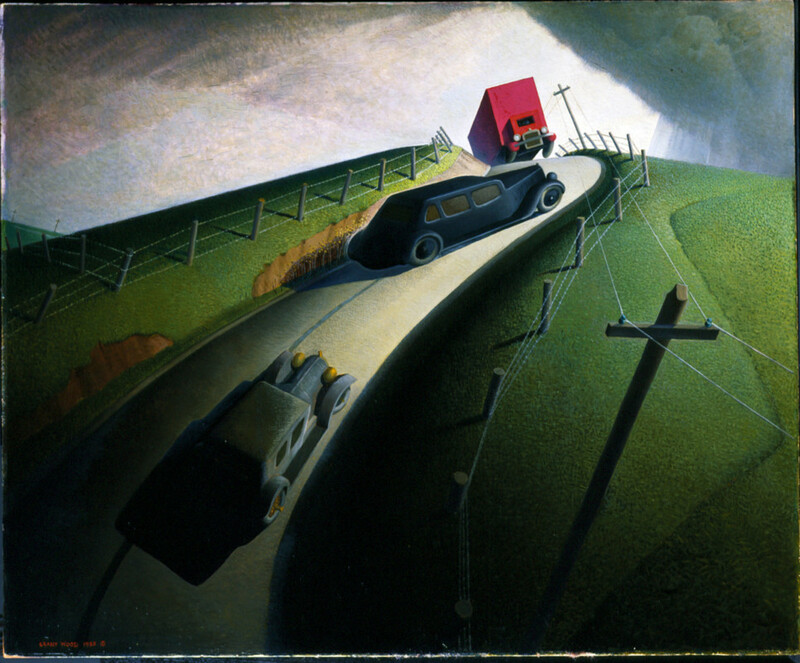 A year after MoMA elevated machinery to high art in 1934, Grant Wood painted Death on The Ridge Road (Williams College Museum of Art), a depiction of the deadly side of the streamlined modern machines that Alfred Barr might have presented at MoMA. A generation later, Andy Warhol’s Death and Disasters series multiplied gruesome images of crushed cars and bodies to numbing effect. During the ensuing years, both Jackson Pollock and David Smith (among others) became traffic fatalities. Roughly bookended by the Great Depression and the 1960s, but also considering works of art and visual materials before and after those parameters, this seminar will explore the stakes of car crash imagery for American artists and culture. Readings may include topics in trauma studies, automotive technology, physics, posthumanism, law, and object oriented ontology as well as grounding participants in American art and history of the middle third of the twentieth century. Participants in the course will also have the opportunity to help shape the content, themes, and narrative of an exhibition on car accidents in American art being organized by WCMA. 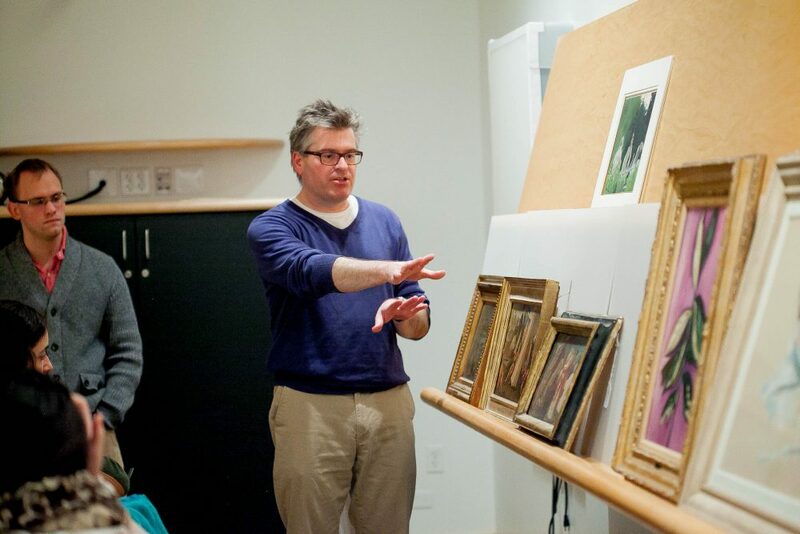 Taught by Senior Curator of American Art Kevin Murphy. Bi-weekly Contemporary Curatorial Workshops are available for graduate students studying contemporary art and curatorial practice. Students present on-going curatorial projects, undertake studio and site visits, host local and visiting curators for presentations, and explore key topics in modern and contemporary art and curatorial practice. Curator Kevin Murphy discusses types of artworks in the Acquiring Art: Selecting and Purchasing Objects for WCMA course. Three objects proposed by the Fall 2017 Acquiring Art course have been added to the museum’s collection. Our Love Is Bigger Than An AIDS Quilt, 2015 by Anicka Yi (American, born South Korea, b.1971), M.2017.21. A May Feast at the House of Folco Portinari, 1274, 1887 by Marie Spartali Stillman (English, 1844-1927), M.2017.20. Willie Causey, Jr. with Shotgun during Alabama Violence, 1956 by Gordon Alexander Buchanan Parks (American, 1912-2006), M.2017.19. How do museums acquire art? Factors considered in selecting objects include: the museum’s existing collection, its mission, the availability of suitable objects, evaluation of the art historical importance of potential purchases, and the available budget. How can objects be identified and obtained at the most reasonable cost? How do auctions work and what strategies are best for purchasing works at auction? Is it more economical to purchase art at auction or to work with dealers or (for contemporary works) directly with artists? Do museums consider value in the same way as private collectors? What role does an object’s history and condition play in the evaluation process? In this course students work as teams to identify and propose objects for addition to the WCMA collection. A significant budget will be made available for the acquisition. Approaches for identification, acquisition and evaluation of objects will be discussed. Student teams are responsible for identifying a set of objects that would make appropriate additions to the museum collection, and a strategy for acquiring one or more of those objects. Working with the advice of WCMA curatorial staff, one or more of these objects will be acquired using the agreed strategy, and the object will become part of the permanent collection. Cotaught by Senior Curator of American Art Kevin Murphy and Professor of Economics Stephen Sheppard. ARTH 319 Rauschenberg Archives course co-taught by Professor of Art C. Ondine Chavoya and Curator Lisa Dorin. Robert Rauschenberg (1925-2008) was a leading figure in postwar American art whose work is considered an important bridge between Abstract Expressionism and Pop art. Throughout his career he worked in a wide range of media, collaborated frequently with dancers and performers, and was dedicated to promoting awareness of causes he cared about, including world peace, the environment and humanitarian issues. The Robert Rauschenberg Foundation archives have recently been processed and opened to scholars for the first time. This course will make use of the archives with the aim of shedding new light on Rauschenberg’s art and collaborations in the form of an exhibition that will open at the Williams College Museum of Art in the spring 2017 semester. 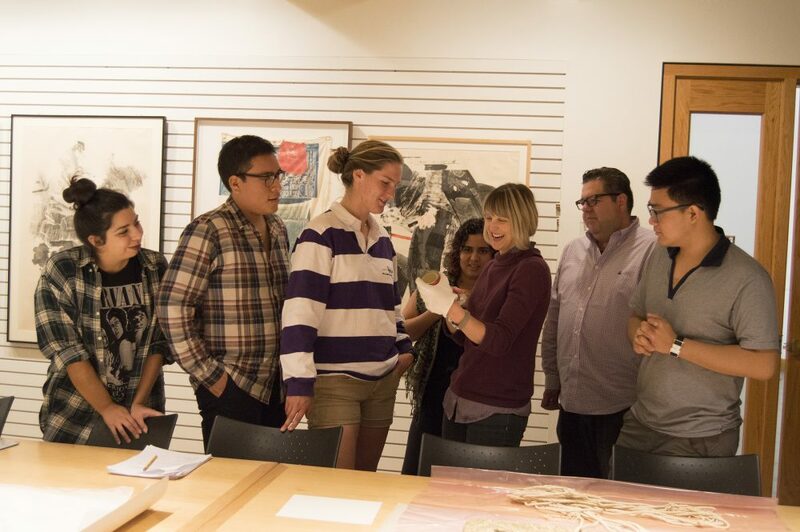 Students will have hands-on access to archival materials and will collaborate on the development of the exhibition through both individual and group activities and assignments. As a class we will critically explore the role and possibilities of research and archives in curatorial practices and museum exhibitions. Course readings will be drawn from the major monographs on Rauschenberg’s art, texts that highlight various historical, theoretical, and methodological approaches to the archive, and primary source material from the Rauschenberg archive. Cotaught by Deputy Director of Curatorial Affairs Lisa Dorin and Professor of Art C. Ondine Chavoya. 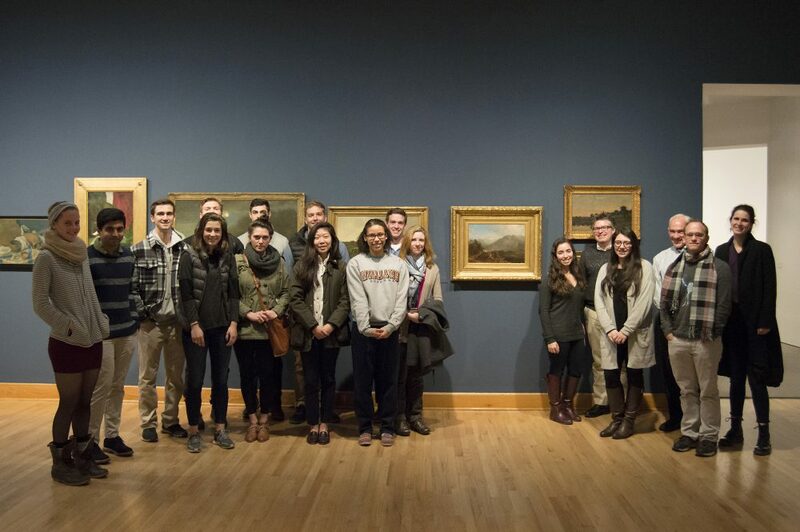 ARTH 327/ECON 227 Acquisition Art course, co-taught in fall 2015 by Curator Kevin Murphy and Economics Professor Stephen Sheppard, with their acquisition. A blend of art history and economics, this fall-semester seminar enrolled 15 seniors and three students from Williams’ Graduate Program in the History of Art. For the first half of the semester, the professors took turns teaching class sessions. Murphy discussed WCMA’s collection and goals as well as what to look for in terms of an object’s condition. “We gave students tools to look at provenance and the history of objects, and to consider questions of authenticity,” he says. Sheppard, meanwhile, provided an understanding of economic modeling and how the art market works. “We taught them to use data-based analytic models, talked about how auctions function and provided bargaining strategies,” he says. Then the students assembled into five teams to research art works. They were given three guidelines—the object had to align with WCMA’s collecting priorities; the students had to view the work in person; and it had to fit within a budget of $25,000, provided by the Fulkerson Fund for Leadership in the Arts. The Experimental and Experiential Approaches course meeting in the Material Friction exhibition at WCMA. Working directly with a collection temporarily on loan to the Williams College Museum of Art, this course examines problems posed by paintings and decorative arts created by artists, artisans, and amateurs in the rural American Northeast from 1700 to 1840 -works labeled “folk” or “vernacular” art. It interrogates the ways in which this material fits (or doesn’t) into existing art historical and institutional narratives of American art, and experiments with modes of display and interpretation using methods from material culture studies, thing theory, connoisseurship, social and physical sciences, philosophy, and economics. Students apply their research to the development and implementation of exhibition strategies that integrate objects into installations at WCMA. Cotaught by Senior Curator of American Art Kevin Murphy and Associate Director for Academic and Public Engagement Sonnet Coggins.